German Expressionism was an artistic movement that started before World War I in Germany, and culminated in the 1920s with Expressionist cinema. It was an extremely influential genre that demonstrated cinema could be an art form, and not just entertainment. These films were a major contributor to the Horror genre and important precursors of Film Noir. While the movement thrived in Weimar Germany, the Nazis were virulently opposed to expressionism, and even had a huge touring art exhibit dedicated to making fun of expressionist art. Persecution led to the movement's decline, and many expressionist artists fled to the States or other friendly countries to escape oppression. Expressionism tends to be characterized by showing the subconscious feelings of the characters and making them the surface of the work. The audience will be shown not what is strictly, naturally real (in fact, painters intentionally avoided it), but an abstract view of what the characters feel is real. Artists preferred to use large shapes and thick outlines rather than natural shading and colors. Shapes are stretched and twisted, and the subjects are portrayed in grim, tense poses. Such art is generally portrayed as fairly dark. Translating this art style into movies usually involved surreal set designs, dialog that dispenses with naturalism to let the characters' inner motivations and thoughts be stated with brutal honesty, and stark lighting effects. A strong, nightmarish atmosphere tends to prevail. In German cinema of the 1920s, Expressionism was actually part of the director's attempts to emphasize the subjective perspective and try and portray psychological complexity within the limits of the silent film medium. Fritz Lang noted that the It Was His Sled aspect of The Cabinet of Dr. Caligari stemmed from their attempts to ground the entire film in a believable reality. As camera techniques improved and actors developed a way of acting for silent films, directors gradually pushed to greater realism in the 1920s. Even Nosferatu was largely shot on real locations, as a deliberate contrast to the Looks Like Orlok vampire who is even more creepy in that believable landscape. 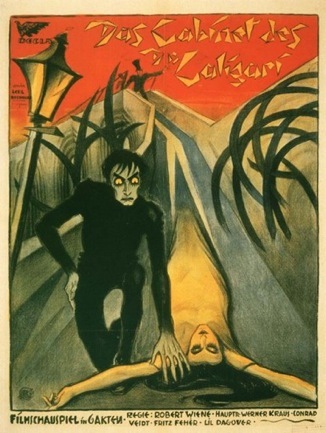 Much modern art, and modern film in particular, is heavily influenced by German Expressionism: films like Edward Scissorhands, Dark City, and Batman Returns are extremely expressionist, and almost any movie that have a nightmarish city, a machine-like bureaucratic government, or an evil AI owes a little to German Expressionism. The Great Depression: Though the genre went to decline during that time, and Hitler's takeover finished it, early examples strongly resemble the atmosphere. Weimar Republic: Similar to Dada, the style was largely born out of German artists' reactions to the horror that was World War One. Themes of devastation and questioning authority abound in many films.